Mukha Linga is a unique Shivling with face of Shiva etched on it and are found many Shiva temples. Some these Shivlings are covered with metal sheaths and the face is etched on the metal. Some Mukhlingas have the entire image of Shiva carved on the surface. On of the most popular form of Mukha Linga is the Panchamukha Shivalinga. In this Shivling, four faces are in four directions and in some Shiva Lingams the fifth face is shown facing the sky and in some it is the southeast direction. The five faces are known as Ishana, Tatpurusha, Aghora, Vamadeva and Sadyojatha. The Shivling worshipped in the famous Pashupatinath Temple in Nepal have five faces of Shiva etched on the Shivling in the sanctum sanctorum. The Shivling as per devotees is not manmade and appeared on its own. Sarvato Bhadra Mukha Linga is very different from the normal Mukhling. It has faces of Surya, Ganesha, Shiva-Parvati and Shiva-Nandi. on south, that of Shiva and Nandi. In some very rare Mukha Linga, apart from the face the hands and burst of Shiva are sculpted on it – one hand is in abhaya, or blessing posture, and the other holds water vessel. 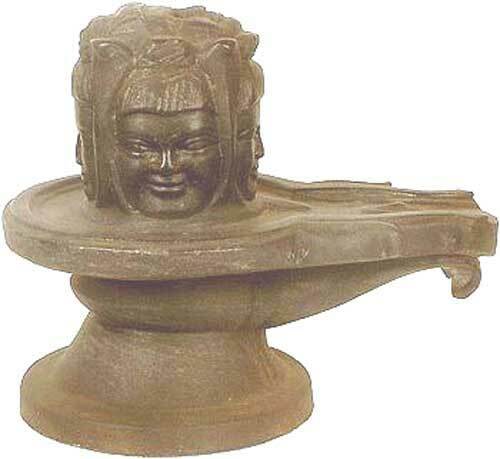 The most popular Mukha linga is the Ekamukha Linga or with a single face. There is also a Srimukhalingeswara Temple located at Sri Mukhalingam Village in Srikakulam District, Andhra Pradesh, India. The Agamas and Tantras prescribe that the Mukhalinga should be made on the pujabhaga of the Sarvasama Linga. A Mukhalinga can have one face or more, up to five faces. Ek Mukhi lingam should be installed with the face facing east. The door of the sanctum should also be on the east. The eastern aspect of Shiva is represented by Tatpurusha. As per Rupa Mandana, Tatpurusha aspect should be yellow in complexion – the color of garment and yajnopavita should be yellow. The hands if present should hold pomegranate in the left hand and rudraksha mala in the right hand.